Holds Tablets up to 10.6 x 7.7"
Securely mount your compatible tablet on an adjustable stand with the Anti-Theft iPad/Tablet Security Stand from Pyle Pro. 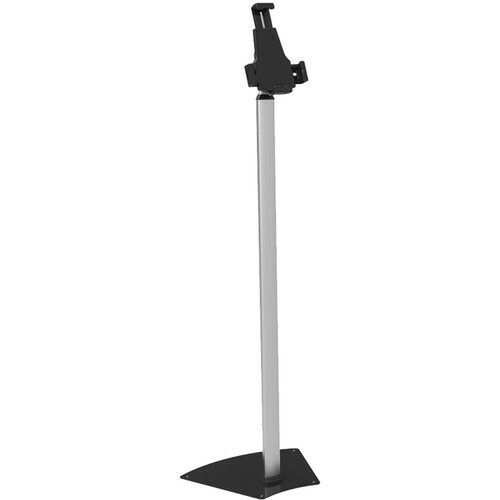 This tamper-proof, floor-standing mount holds iPads and other tablets measuring between 5.2-7.7" wide and 7.7-10.6" tall, including the Apple iPad mini (first through fourth generations), the first- and second-generation iPad Air, various Amazon Kindle e-readers, and most Samsung Galaxy tablets. The stand features a height-adjustable pole, a laptop-style lock, tilt and rotation adjustments, and the ability to hold tablets in portrait or landscape orientation, while cable management allows you to hide power cords. Mounting hardware and brackets are included. Box Dimensions (LxWxH) 48.0 x 15.0 x 3.5"